The battle rages on as the Avengers vs. X-Men mini series comes down to its last issues. Marvel made it known a few weeks ago, that a character with a strong influence on the X-Men and Avengers world would perish in the fight. I’m sorry to say, that character’s pages were numbered in this issue. When I started to think about the characters who’s death could bring a significant change to both teams, I could only think of two people that could be; Hope and Professor Xavier. In the end, I came to conclusion that Professor Xavier’s death would make more sense, because of the impact his life has had on the Marvel Universe and reverberations his death would have on the X-Men for years to come. Marvel confirmed my logic the same day the issue was released. I’ve known Professor Xavier since I was a kid and he has always been one of my favorite characters in the animated series. His death, though expected, was still a blow. I guess that means the writer, Brian Michael Bendis and the artists, Olivier Coipel and Mark Morales, did a good job with the scenes where he died. Something else that I kind of expected to happen was Cyclops taking the Phoenix power from Emma and becoming the Dark Phoenix. I’m at a loss to say, though, what I think will happen next. 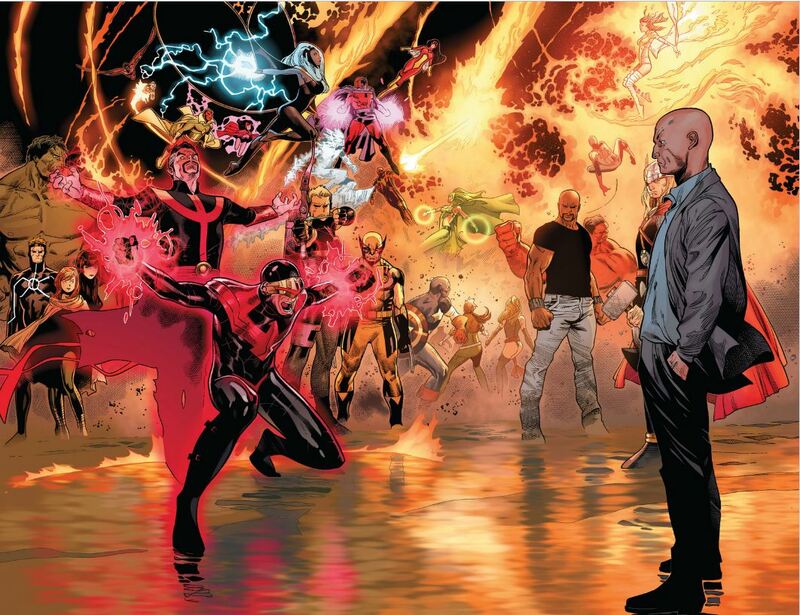 My best guess would be that in some way, Hope will come to save the day and the Avengers will find a way to force the Phoenix out of Cyclops and back into space (or some other location). I’d love to see Jean Grey show up at some point, but I think that may be asking to much. I guess we will all find out who wins in the final issue, to be released in two weeks. You can purchase Avengers vs. X-Men from your local comic book store and Comixology. The graphic novel is up for pre-order on Amazon now. This month the DC Comics zero issues take us to the origins of our heroes, before the beginning of the New 52. While I had been looking forward to Worlds’ Finest #0 and Birds of Prey #0 , it was Batgirl #0 that really had me champing at the bit. I have yet to be let down by any of Gail Simone’s work on Batgirl , and the #0 issue was no exception. Batgirl #0 has everything you could ask for in a origin story. Barbara talks about her family’s obsession with darkness and how it drew her to learning all that she can about the mysterious Batman. After Barbara finds herself taken hostage and decides to take her fate into her own hands, she shows us just how capable she is of taking care of herself before Batman trains her. The issue is rife with foreshadowing — James Jr., creepy much? — and hints at stories from the past that are still to be revealed. Batgirl #0 is a great place to jump into Barbara Gordon’s world and reminds me how much I’ve enjoyed reading her exploits in this past year. I can’t wait to see how the foreshadowing plays out. Machine Teen arrived with a stack of review copies of recent Marvel collected stories on my doorstop. I had never heard of the book but the striking cover by artist James Jean immediately drew my attention. It’s the story of a young man with a seemingly perfect life in high school–quarterback of the football team, straight A student, supportive and beautiful girlfriend–whose life begins to unravel due to mysterious seizures. The cover gives away what is causing these seizures, as our hero is not human at all but an intelligent machine. 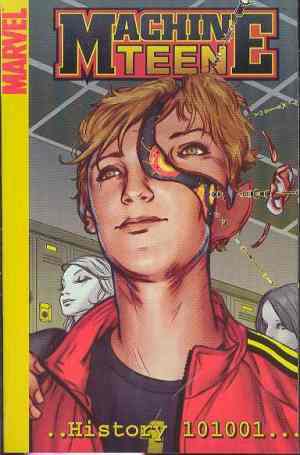 All that is covered in the first issue and then the story moves away from Adam trying to fit in at school to dealing with the revelation that he’s not a real boy and then trying to escape those who want the technology that created him. The story ended in a way I didn’t expect, though it was still hopeful. And I liked the nods to the fact this takes place on Marvel Earth, such as Adam’s Spider-Man t-shirts, but it’s a complete story than can be read by someone who is completely unfamiliar with any other Marvel stories. My eldest son started reading it and pronounced it “really interesting.” The story is by Mark Sumerak with interior art by Mike Hawthorne. The 2012 Top Shelf Massive $3 Sale! Dark Horse Star Wars 1/2 off sale! If you’ve ever wanted to dabble in the dark side, check out Dark Horse’s 1/2 off sale on select Star Wars comic books. This is a great time to check out some of the greatest stories never told on the big screen.